A modification to an existing wine cellar, adding a multi-layer mahogany ceiling with LED up/down lighting, special fixtures, limestone flooring, stone walls and shelves and a waterfall curved extension to the racking. Brick wrapped walls and flooring, a special see-through window into the cave from the main hallway and semi-industrial metal and wood racking complete this wine cellar in New Canaan, CT. 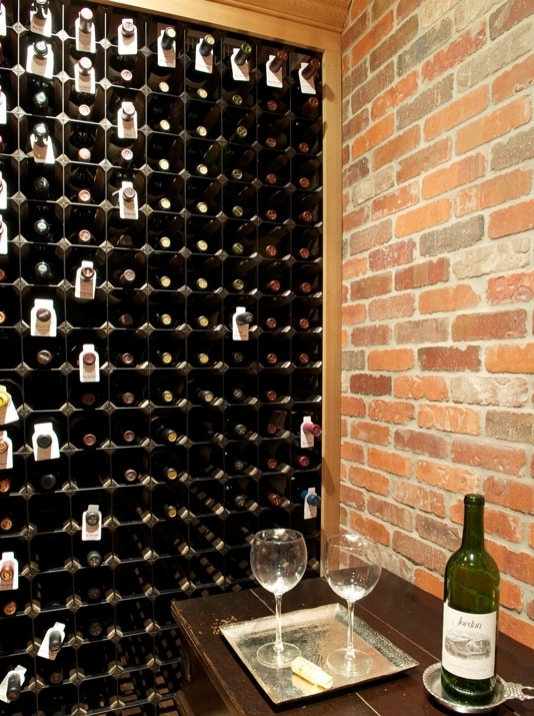 The rich patina of the brick walls creates an ideal atmosphere for wine enthusiasts. This waterfront home received an extensive gut-renovation and addition. One of the homeowner's wishes was to have a wine cellar. More modern natural wood cabinetry and a stone floor complements the oenophile atmosphere.